One of the last remaining criticisms of the iPhone is its lack of a memory card slot. Whatever amount of memory comes with the model of iPhone you purchase, is what you’re stuck with until you decide to upgrade. The good folks at PhotoFast have decided to remedy that situation with their new i-FlashDrive. 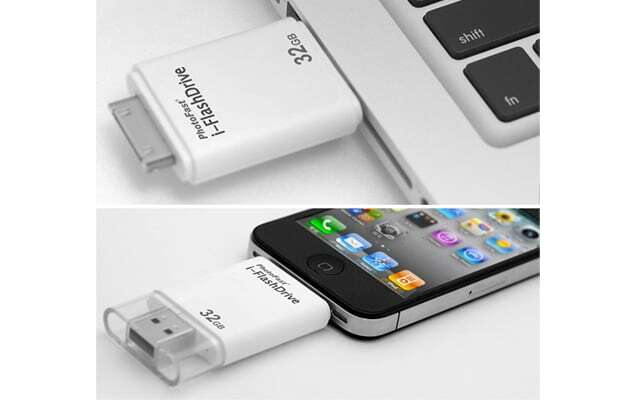 Able to connect to the bottom of your iPhone, iPad, or iPod Touch via Apple’s dock connector, the i-FlashDrive allows users to store and transfer files—and contact lists—from their iDevice using an accompanying iOS app. The other end has an USB connection so you can transfer files from your computer to your iPhone and vice-versa. The i-FlashDrive is available now from PhotoFast in 8 GB, 16 GB, and 32 GB configurations. Prices range from $99 to $192 depending on the storage size.